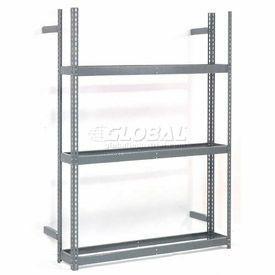 Boltless Rack & Shelving - Wood & Wire Decks are an Economical Way to Customize Your Storage Set-up. These heavy duty shelving decks connect to Global boltless shelving units without tools! Simply slide the deck over the top of Boltless Shelving Beams to create a sturdy surface. Available in a variety of sizes. Larger decks ship in two pieces to reduce shipping costs. 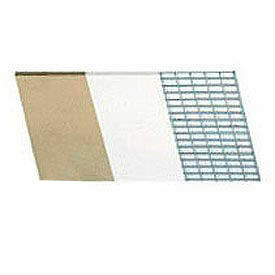 Wood Decks are 5/8 " thick and create a heavy duty, solid surface to hold merchandise. Laminate Decks are 1/2" thick and feature a melamine surface that is easy-to-clean and stain resistant. Wire Mesh Decks are made of 1/4" dia steal and allow light, air, and sprinkler penetration while still holding up under the heaviest weights. Each level requires four beams. Double Rivet Beams must be used on top and bottom levels of all units. Single Rivet Beams can be used on all intermediate levels or increase capacity by using Double Rivet Beams on all levels. 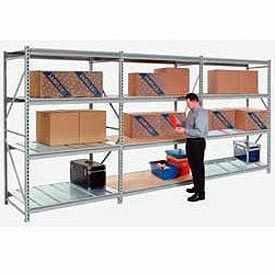 Beams can be used as ledges at any required height to prevent merchandise from falling or rolling off shelves. 14 Gauge. Punched on 1-1/2" centers for easy beam adjustment. 12"L brackets connect to wall for additional stability. 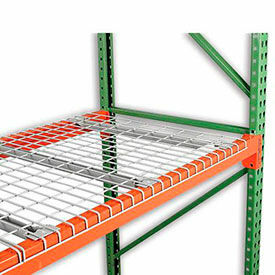 Connect two shelving or rack units side-to-side or back-to-back using tie plates. 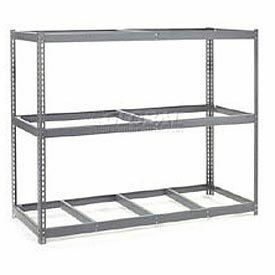 This cost-effective, sturdy metal storage rack offers almost twice the capacity per level (Up to 3,800 lbs) as standard racks. Easy assembly. Beams Horizontal beams' boltless design allows installation without tools or hardware and adjusts in seconds at 2" increments. Upright Frames are 14-gauge steel measuring 1-3/4" x 1-3/4". Gray powder coat finish. Steel Deck Ribbed-Formed, Heavy Duty, Galvanized Steel. 1) Uprights - 72", 96" or 120" High x 24", 36", or 48" Deep. 2) Beams - 60", 72" or 96" Wide. 3) Decking - Wood, Wire or Steel. 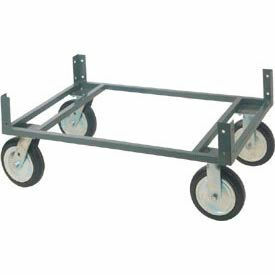 Attach casters to a dolly base to mobilize your storage shelving or rack. Rugged 14 gauge welded frame. 1200 lb. capacity. Gray enamel finish. Order casters separately. 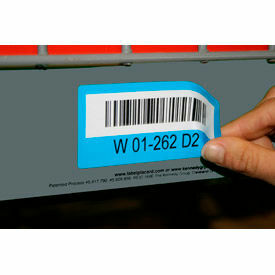 The Rack Placard Removable Label Holder was designed to identify racks and shelving by providing a clean surface for any label or barcode to be applied and removed effortlessly. Flared Channel Decking is a waterfall design used on Box or Structural Beams. Ready Deck™ decking is strong, safe and reliable and simply drops into place for easy installation. Improves performance of sprinkler systems, increasing fire safety. It is self-cleaning and maintenance free, and will provide years of durable use. The Ready Deck™ Line will accommodate most structural beams found in the industry today.